Amada Miyachi America, Monrovia, CA, has debuted its updated LMWS pulsed-fiber-laser welding system, a highly configurable, compact unit designed for lean manufacturing, according to company officials. The unit features a high-power—20-70-W—high-speed laser, for welding metals and plastics. It reportedly is ideal for welding dissimilar metals, including copper to aluminum, aluminum to stainless and mild steel, and copper to stainless steel. By simply changing the settings, this unit also can be used to mark welded parts. 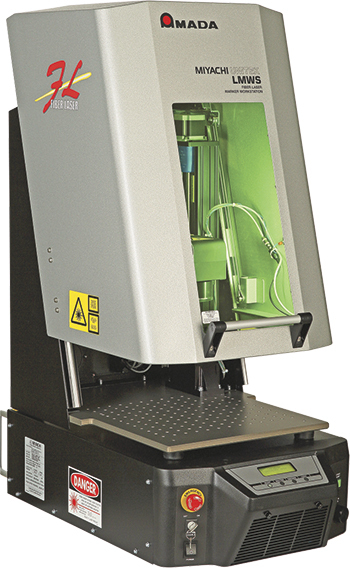 This series has numerous performance options to match the laser to the application. When paired with the LMF20-SM pulsed-fiber-laser welder, the system offers 20-W precision welding for small feature sizes. Paired with the LMF70-HP 70-W pulsed-fiber-laser, the LMWS offers an advanced processing system for welding thin metals, to 0.010 in. thick. The LMWS is available with a variety of integration options to match process needs. It comes standard with an XY galvanometric scanner. XYZ and rotary stages or through-the-lens and off-axis camera options also are available. The LMWS unit comes with integrated stage controllers for as many as four axes of motion, for use in such applications as step and repeat welding, focal-plane height adjust, and rotary welding. Weld types include single-point object arrays, basic shapes (rectangle, circle and spiral), wobble function and vector graphics, including CAD, line drawings and logos. See also: Amada Miyachi, Inc.